Don Mclean and Vincent Van Gogh. A Look at how these two artists found each other and became entwined together forever. Sometimes in life we don’t need to know a person inside out to understand what they are all about. It’s a knowing or a feeling that we have inside that we go with that leads us to creating a piece of work that marries together people. 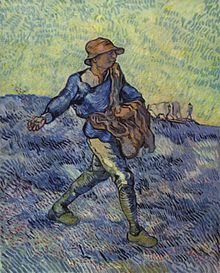 If Vincent Van Gogh was around now, I am sure that he would be filled with appreciation and admiration for Don Mclean who in this beautiful song captures what Vincent really felt. Don McLean wrote Vincent in his apartment full of antiques. The inspiration came to him one morning while he was sitting on the veranda looking at a book about Vincent Van Gogh. As he studied a print of Van Goghs painting Starry Night, he realized that a song could be written about the artist through the painting. The more I thought about it, the more interesting and challenging the idea became. I put down the book and picked up my guitar, which was never far away, and started fiddling around, trying to get a handle on this idea, while the print of Starry Night stared up at me. Looking at the picture, I realized that the essence of the artists life is his art. And so, I let the painting write the song for me. Everyone is familiar with that painting. Van Gogh painted Starry Night during one of the most difficult periods of his life, while he was locked up in an asylum at Saint Remy. He had to paint the scene from memory, not outdoors as he preferred. Van Gogh mentioned Starry Night only twice in his letters to his brother, Theo. 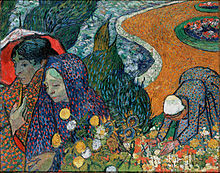 It is therefore one of the more mysterious and intriguing Van Gogh compositions. Vincent wrote many things and here are a few quotes by him. Those who love much, do much and accomplish much, and whatever is done with love is done well…. Love is the best and noblest thing in the human heart, especially when it is tested by life as gold is tested by fire. Happy is he who has loved much, and although he may have wavered and doubted, he has kept that divine spark alive and returned to what was in the beginning and ever shall be. So what do you want? Does what happens inside show on the outside? There is such a great fire in ones soul, and yet nobody ever comes to warm themselves there, and passersby see nothing but a little smoke coming from the top of the chimney, and go on their way. It is possible that everything will get better after it has all seemed to go wrong. I am not counting on it, it may never happen, but if there should be a change for the better I should regard that as a gain, I should rejoice, I should say, at last! So there was something after all! A quick intro into stitching on paper a peacock design. Embroidery on paper is the craft of sewing designs on to paper or thin card. It is an excellent way of making greetings cards, bookmarks and table decorations. There are patterns available that enable you to produce beautiful results even if you are a beginner. All you need are blank cards, thread, a sewing needle, a pricking pin and a pricking mat. All can be bought from a craft shop.� Once you have drawn out your picture and pricked out the pattern, you can then start to sew your image. In 1998 an English craft company called Card Inspirations launched some stitching cards under the trade name of Form-A-Lines. The first Form-A-Lines stitching cards were designed by Anne Harding and Linda Jefferson. David Jefferson then used a standard computer drawing program to convert their cards into the patterns for the first two Form-A-Lines kits. The kits proved very popular and more designs soon followed. What this emotional quote portrays is that he was deeply affected by his mother�s physical illness coupled with the aftermath of the mental distress suffered by his father, which provoked irrational behaviour brought on by his father. In amongst this angst and mental torture there were however happier moments in the artist�s life. At times Munch would attend hospital with his father and learn to draw the patients in bed from which he learned how to compose small groups of figures. Sickness was to become a theme which frequented the artist�s work. Not only had he to cope with his own bouts of ill-health, suffering from asthmatic bronchitis and several severe attacks of rheumatic fever, which badly interrupted his schooling, but in 1879, when he was fourteen, his older sister Sophie died of the same disease as their mother. Tuberculosis was sadly a slow painful condition. As a young, impressionable and sensitive boy it must have greatly affected Munch to watch while another loved one was taken by illness. Eight years later Munch began to paint the first of six versions of that scene, called The Sick Child. This picture seems quite conventional to us today but it caused an outrage when it was first exhibited at the Oslo Autumn Exhibition in 1886 because it was totally unlike anything that had come before it. Aged seventeen, Edvard Munch began to study art formally when his father, having given up hope of him becoming an engineer, allowed him to enter the Oslo State School of Art and Handcraft. The following year of 1881 he produced his first significant painting, The Hospital Ward, and then followed several portraits and family studies. It would be the next twenty years where he travelled extensively in France, Italy and Germany. In Paris in 1885 he came under the influence of the Impressionists and from 1890 it was the first the Nabis and then the Post-Impressionists, especially van Gogh and Gauguin, who claimed his attention. But to every cloud there is a silver lining and in Munch�s case this lining was called the Berlin Secession. This was a group of Berlin artists who were so outraged by the treatment of the Norwegian painter that they formed an alliance to counteract the conflicting views of cast by the art establishment. Munch remained in Berlin where he found many important friends and gradually gained general support for his art works. In 1902 he exhibited 22 of his Frieze paintings, many of which he also produced woodcuts and etchings, two works included in this were The Kiss and The Scream. These made a great impact, as the emotion entangled in these paintings could be seen in the erratic and organic brush marks as well as the subject matter itself. For some time after this his pictures became more extroverted with his colours seemingly brighter in appearance. In 1914, back in Norway, he was commissioned to paint a series of large mrals for the University Hall of Oslo, depicting the forces of nature, science and history. He completed these in 1916. Later, as he struggles with illness and self-doubt, the art work of Edvard munch became once more anguished, torturous and embodied with emotion. After his breakdown he never left Norway. In 1916 he settled in Ekely, Oslo, and lived a solitary life free from relationships, external influences and stranded with his own thoughts. His 70th birthday in the year of 1933 was internationally recognised, but his works were considered degenerate by the Nazis and removed from the German museums. Munch died peacefully of pneumonia at the age of 80 in 1944, two years after his first exhibition took place in the USA. Expert artist Liberace puts this video together to show the aspiring pencil artist just how important it is to take in all the features you see on the human body. Here he is drawing a male life model pulling on a rope and his aim using a combination of cross hatch shading and blending with a brush shows how the muscles and motion in the figure can be accentuated. He explains how you will never fully achieve perfection but it is important to note everything which is going on in what you are studying. Great artwork which does truly show motion and action within the human form. In this video tutorial you can learn from this professional pencil artist how to draw a foot using just a black Prismacolor pencil crayon. The video is only short but it holds all the basic principles required for you to learn how to draw the foot which is considered on eof the most complex parts of the human anatomy. He begins by very lightly drawing out the basic geometrical box dimensions which carry the basic proportions of the foot and this serves as a building block for him to add the more intricate details like the toes and ankle area. The artist works quickly and exudes confidence with the pencil as he uses a mixture of faint and heavy pencil lines to slowly form the features of the foot. He draws each section evenly by moving the pencil across the page making sure he doesn’t get too engrossed in one certain region. 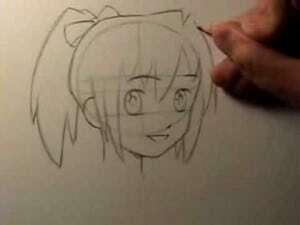 By doing this you can quickly lose the proportions of your drawing and have spent an awful lot of time and detailing focusing on one particular aspect of the drawing. The artist uses faint guidelines to mark out his areas and is adding shade and tonal qualities in a cross hatch form just as quickly as he is drawing the form lines to create a realistic interpretation of the foot. The way he holds the pencil is also unique but also much easier when you are sketching in this manner. It allows a more fluid and organic flow across the paper with the pencil and rapidly speeds up the �drawing on the whole. If you are interested in learning to draw the human anatomy in more detail then this particular artist is a great source to learn from. He is confident, accurate, quick and unorthodox and is living proof that with practice and some basic principles you can easily learn how to draw the human form or any of its features. In this video tutorial the artist Chris Legaspi demonstrates how to draw the limbs in three different examples using charcoal. It is a gestural drawing video aimed at the intermediate to advanced artist showing how to locate the main shapes which make up the human body ie the limbs and torso. The artist narrates over the top and teaches how to select which outlines to emphasise to create a solid 3D form. Charcoal is very versatile so don’t be too reserved or scared to be bold with your application. A nice video to learn from. This is a nice general video for beginner’s to follow and discusses the basics of drawing the male form and it’s proportions. Generally speaking the average body is 8 heads tall, so with this in mind that is the first thing to remember when ascertaining the height for your person you are drawing. The artist uses a ruler to mark off 8 spaces to mimic the head theory down her paper and then draws a series of horizontal lines �to suggest the different proportions of the human figure. With clear and concise easy to follow voice over descriptions you are guided through the video picking up all the basic techniques as you go along, so why not grab a pencil and have a go yourself. Carles Gomila seeks�to paint works that are tender and yet disturbing, evocative full bodied and elegant. He loves painting the human figure based on the real human anatomy plus his own imagination and feels free to represent the human figure and redeem the values of classical art from a contemporary perspective. This video has been cleverly produced to demonstrate the artist at work whilst at times using metamorphoses to take the viewer through to the finished piece, as well as creating a sinister feel throughout. 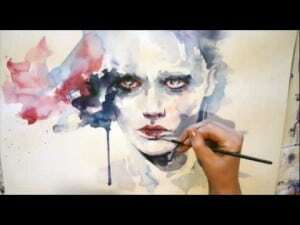 Powder paint and charcoal mediums can be seen within the video, using paint brushes and palette knives to compliment.